Writing equations. Once we assign variables, we have to write an equation and solve. Many students can do the algebra once they have an equation, but getting the right equation can be tricky. I'll review some basics of translating from words to math, so some of this might be familiar already. The words is or are, the verbs in the text, correspond to the equals signs, so that's very important. Means as we're translating when we get to is or are, that's where the equals sign is in the equation. If we have A is 50 meters, is 50 more than B. So A is, that's A equals. And then this way of saying it, at least in English, 50 more than B, what we're saying is B plus 50. So it's a little bit backwards from the way we write it mathematically. We write B plus 50 but we say 50 more than B. So A = B + 50. If we had A is 50 less than B, well this one also is backwards, 50 less than B, it means we start at B and go down by 50, so that's B minus 50, so A equals, A is 50 less than B, B- 50. Suppose we have something like twice A is 100 less than three times B. Well, twice A, that would be two times A is, so 2A =, that's the first part of the sentence. Three times B, that's 3B, and then 100 less than 3B would be, 3B- 100. So, that's how we'd translate it. Suppose we have A is 50% of B. So A is, A = 50% of B. Well, if we're finding a percent of something, we simply change that percent to a decimal and multiply, so that would be 0.50 times B. And notice that whole equation, A = 0.5B, or A = one-half B. We could just multiply both sides by 2. 2A = B, and that would be the same information, but without any fractions or decimals. Now, by contrast, suppose we had A is 50% greater than B. Well, this is very different. This is not the same as the one before, and you may remember from our discussion way, way back in the percents and ratios and fraction module, 50% greater, that is a percent increase, and the multiplier for a percent increase is one plus the percent as a decimal. So 50% as a decimal is 0.5, 1.5 is the multiplier, so A is, A = 1.5B. We could also write that as three-halves B and so forth. Here's a practice problem, pause the video and then we'll talk about this. Okay, Alice and Bruce each bought a refrigerator and the sum of their purchases was $900. Okay, so we use the very simple variables A and B for the price they spent, A plus B, the sum equals 900. That's one equation. If twice of what Alice paid was $75 more than what Bruce paid, what did Alice pay for her refrigerator? So the first equation, the sum of their purchases is 900. Twice of what Alice paid, two A was, equals, two A equals 75 more than Bruce. B + 75, so that second equation is 2A = B + 75. Well, we want to get what Alice paid, so what I'm gonna do is I'm gonna solve that first equation, the equation on the left, I'm gonna solve that for B, so that when I plug that into the second equation, I replace B, then I'll just get an equation with A. So I'll plug that in and then I'll add A to both sides. I get 3A = 900 + 75. I'm just gonna leave it like that, not even add them up because I have to divide by 3. Well, if I divide by 3, clearly 900 divided by 3 is 300. And 75 divided by 3 is 25, so it's just 300 + 25 or 325. And that's what Alice paid for her refrigerator. Here's another practice problem, pause the video and then we'll talk about this. Okay, in a certain company, 50% of Ed's salary is 20% of Ruth's salary. If the difference between their salaries is $90,000, what is Ruth's salary? Okay, so first of all, 50% of Ed's salary, so that, we could write that as 0.5, or we could write that as one-half of Ed's salary, is 20%, so that's 0.2 or one-fifth of Ruth's salary, so we can write this in terms of fractions. So half of Ed is a fifth of Ruth. So notice, incidentally, what this means is that Ruth must have a much larger salary, because we can take only a fifth, a small part of her salary, and it equals half of Ed's salary. So Ruth is the bigger one, Ruth minus Ed is 90,000. Okay, so as in the last problem, we want to solve for Ruth. So it means one of the equations, I'm going to solve for Ed's salary and then use that to plug into solve the other. And I'm gonna choose to solve the left equation, I'm just gonna multiply by 2, I'll get E = two-fifths R, and then I can plug that into the equation on the right. So I get R minus two-fifths R, and of course R minus two-fifths R is three-fifths R.
You take away two-fifths of anything, you're left with three-fifths of it. Three-fifths R equals 90,000, divide both sides by 3. One-fifth is 30,000 multiplied by 5. R = 150,000, and that must be Ruth's salary. Many times, writing the correct equation depends on the specifics of the problem. In the upcoming lessons, we will talk about several specific topics and word problems, and in those lessons, we will discuss typical equations for those topics. In summary, we talked about how to translate words into math. Those are very, very important skills to have mastered. Remember that you may have to do a certain amount of algebraic setup before you can write the equation you will solve. 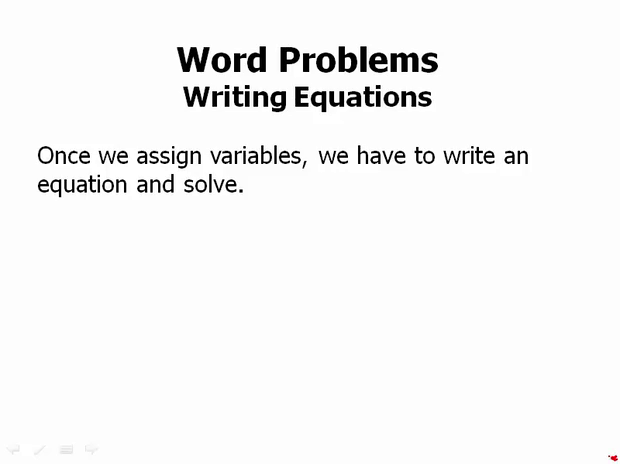 And as I said at the end, many topics have typical equations, which you will learn in the upcoming lessons on the different word problem topics.